Above average is not enough! 1.Why do I need PFL? The Personal Fitness Level or PFL program is a new training system based on UK and US statistical data to give you an indication of how fit you are. This is measured on a scale of 1-8 Levels which have each been accredited with two scores; Population Score and Athletic Score. With this information to hand you will always have your path to success laid before you, and further more you can also be certificated for each level of the PFL program. Unlike many training programs PFL does not focus on one type of energy system like strength or cardiovascular, this can be counter-productive in creating a balanced healthy body, so instead the PFL program covers the entire spectrum of the human body’s physical ability including; stability, cardiopulmonary, strength, power and speed, agility and quickness. This also means that PFL easily crosses over to different sports and activities. But it does not stop at general health either, instead the PFL Program looks to go beyond ‘the norm’ in order to see just what a human body is capable of achieving! 1. Click on the PFL Records link located at the top of this page to view or download the level required (Level 1 for beginners). 2. Watch the demo videos on the Discipline Library page, to help with correct execution of the disciplines. 3. Read through this web page thoroughly, to make sure you understand how to use the PFL system in order to achieve the best results and to do so safely! PFL is free for all to use, but Stuart Ford FIT cannot be held responsible for accidents or injury resulting from lack of experience or assistance acquired before commencement of the program. So it is strongly advised that individuals seek expert guidance and supervision before beginning PFL. Stabilisation is the first step in creating a safe and integral structure of the body’s joints and frame, with enough flexibility and mobility to perform everyday movements and carry load. In the same way we can stabilise the cardiopulmonary system which comprises of the heart and lungs in preparation for more vigorous exercise. After stabilising the body we can start increasing load and repetition speed to enable us to lift and manipulate more weight and cope with higher levels of resistance. When your strength has reached a practical standard you can begin the fun stuff! Power and skill is the stage many of us ‘jump’ straight into before tackling the two previous categories, running for example is a power exercise (for the calves and shins at least) which commonly leads to injuries when performed too soon and with poor posture. So power and skill are generally used together to perform any explosive movement which can compensate for a lot of strength as you will see when a Powerlifter picks up more weight than he/she can with just strength. Finally we focus on pure skill and sharpening of the body’s basic senses, coordination and movement patterns to help in learning how to put your new abilities to use. is the entry level into the program and focuses on the Stability and Cardiopulmonary category as detailed above, in order to make sure the body is in a healthy enough condition to commence a more varied training program. On completion of this level you will already be in the top 5% of the population. is the next milestone and introduces the last of the basic categories SAQ. At this level you will be considered soundly fit for a healthy male or female respectively, it will also mean you are at a level of health to safely take part in advanced physical activities like: athletics, gymnastics, powerlifting, rugby, football, martial arts and parkour. But this does not mean that you are in a remarkable condition, only 'sound', if this seems extreme to you then please remember that the average standard of health in today’s Western society is at an all-time low, mostly because we are not nearly as active as we are designed to be! This is highlighted by the fact that you will now be in the top 1.25% of the population. will catapult you into the world of the Elite Athlete, but unlike most athletes if you are able to maintain standards in all categories then you will have the edge over many competitors and set the groundwork for superhuman feats! Level 8 will set you firmly in the top 0.025% of the Western population. The Disciplines listed in the PFL Program categories have been selected to highlight the most fundamental and important functionality of the human body, and to demonstrate an individuals capability in each respective area. They do not however constitute an entire fitness regime and must be used in conjunction with a well balanced variation of appropriate exercises. The PFL Program although consisting of some great core foundation exercises, is rather more of a reference and testing tool. So it is strongly advised that individuals seek expert supervision and visit the Discipline Library below for guidance before attempting any of the disciplines listed, you can also follow the contact details in the Contact Page to book individual or group training sessions or ask any questions regarding the program! After completing Level 1 and it's category of Stability and Cardiopulmonary, you will see from the PFL Score Chart that each category is continued in the next level, and so on with Strength in level 2, Power and Skill in level 3 and SAQ in level 4, so that eventually you will be practicing all of the categories for each remaining level, just to a higher standard. It is important to maintain a balance of all the foundation categories in any activity to avoid injury and safely work towards peak performance. As stated previously, the PFL Program is designed to seek a balance and ultimately for a participant to be of superhuman levels of fitness. But in some respects there are definate limitations for a human's energy systems which contradict this ideology. Without going into too much depth in the area of cellular energy production, the human body has two types of muscle fibres; Type I - Slow Twitch and Type II - Fast twitch. 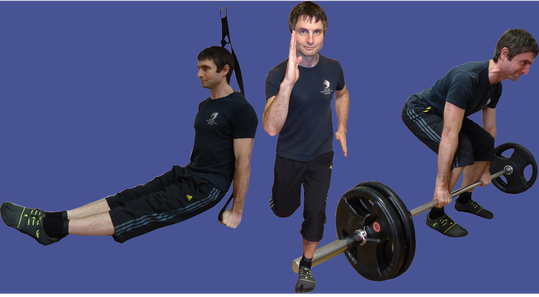 Type I are utilised for aerobic activities such as long distance running, and Type II are used for anerobic exercise such as weight training and sprinting. Now the body has a mixture of both muscle fibres naturally, and some people will have more of one type which makes them naturally better at certain activities than others. When we train repeatedly in one area we can increase the amount of each type, but ultimately we can only reach a 50/50 ratio of Type I and Type II muscle fibres making up our total body's structure. This in turn puts tremendous limitations on the end result in either area of training which means that one side has to give. The PFL System therefore concentrates on Type II muscle fibres for two main reasons; one is that it is very difficult to maintain high standards of aerobic capacity and this will diminish very quickly, not to mention the long periods of time spent pounding the body and heart with repeated movements which can have little impact on an individual's 'body skill'! The other main reason is to do with how we use our body naturally in everday life. How often does a person raise their heart rate to say 70% and sustain that for an hour or more? It is more likely that we will have either a very mild constant level accompanied by a short duration of harder exertion, or a resistance based task of lift and carry. If we also consider that when we are performing hard physical exercise the majority of us will struggle with other determining factors such as joint pain, flexibility, muscle fatigue and coordination! So to sum up, the PFL Program will create a sound and healthy cardiopulmonary system, that is capable of handling lower level sustained aerobic exercise as well as short bursts of exertion. Each level of the PFL Program has two scores associated with it, these are the Population Score and the Athletic Score. This is an approximate indication of where your health and phisical ability lies within the U.K and U.S nation as a percentage and begins at Level 1 which points to only 5% of the population and ends with Level 8 which correlates to a tiny 0.025%, so if for example you have passes Level 4 then you are in the top 1.25%. The Athletic Score begins with Level 1 as the start of the 'Athletic Population' as 100%, as even the novice athlete has a reasonable fitness level, and then ends with the start of the 'Athletic Elite' at Level 8 as 0.5%. So if for example you pass Level 4 then you are in the top 25% of the Athletic Population. This may seem like a small percentage of athletes to reach Level 4, but you must remember that PFL tries to gauge all aspects of fitness, where as an athlete as we might know it may only focus on one area and fall short of another! If you think you are ready to pass any of the levels then you can take part in a controlled assessment, this can lead to a certification and recognition of your PFL standard. Please note that participants must pass level 1 before attending any higher level assessments! Assessments will be conducted at a suitable location to be arranged. Assessments will be category specific, meaning that only one category will be assessed during one assessment, wherein all the disciplines will need to be performed to the standard indicated including; correct form, technique and score. The categories of Power & Skill and SAQ will however be assessed as one unit from Level 4 onward. Each assessment will last up to 1 hour and include a functional warm up. Each discipline will then be tested in the order listed on the PFL Chart and PFL Records, with a 2 minute rest in-between each discipline. It is suggested then that participant's train to a standard where they can achieve each discipline criteria with less than 100% effort to avoid excessive fatigue, loss of technique and injury! Below are the main references used to help construct the disciplines, levels and percentages in the PFL Program, but many other references were used as comparisons and indicators including personal experience and client data. It must also be noted that very little data into national fitness levels exists or by themselves can be wholly relied upon.